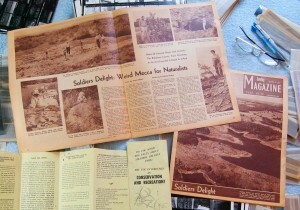 A brief article about Soldiers Delight in the brown section of the Sunday Sun Magazine, August, 1960. Digging around for 40 year old negatives last week turned up a couple of even older things. I found a little T-shirt, and a couple of copies of the Sunday rotogravure section from The Baltimore Sun for August 21, 1960, 53 years ago today. 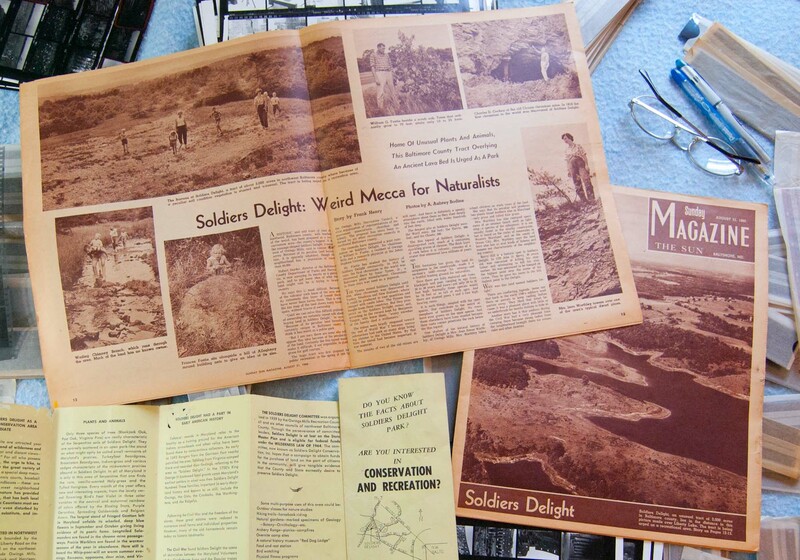 The brown section had been archived because it included photos of my entire family in a two page spread about Soldiers Delight. We were honored to be pictured in this article because the photographer was A. Aubrey Bodine who had worked for the Baltimore Sun since 1920. We were chosen to be the models for this photo shoot because my parents were advocates for the preservation of the undeveloped tract of serpentine barrens near our home in Owings Mills, Maryland. Also because we were really cute. A. Aubrey Bodine photograph of Fasties and Worthleys under the power line downhill from Red Dog Lodge in Soldiers Delight. 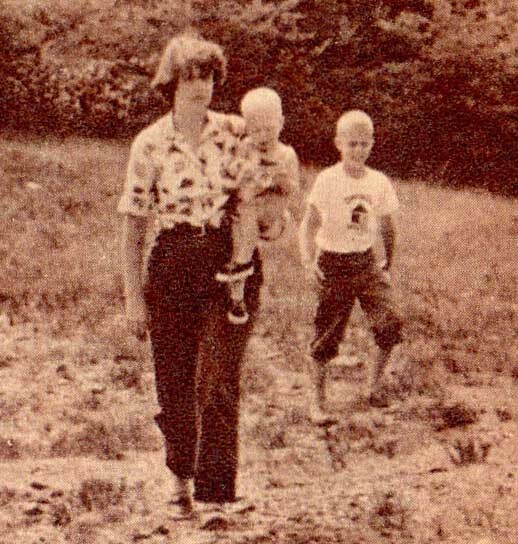 My favorite photo in the spread was the big one with my two siblings, our mother, Jean Worthley, and two of her sons. Thin soil and depauperate vegetation are characteristic of Soldiers Delight, but the ground depicted here is at the intersection of two vehicle tracks under a power line. So this is not typical of the ground surface at Soldiers Delight, which supports a sparse but diverse grassland where the soil is too thin for trees. Photographic honesty was never a Bodine trait – he was famous for adding clouds, seagulls, and other things to his photos back when that was a delicate darkroom skill. Probably because of his influence, I have never had any qualms about using Photoshop any way I can to let a photograph tell a story better. 2010 aerial photo with the location of the 1960 Bodine photograph. 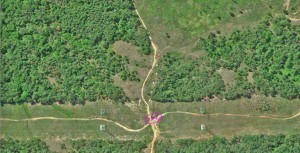 We were under the power lines where two roads cross (pink oval). 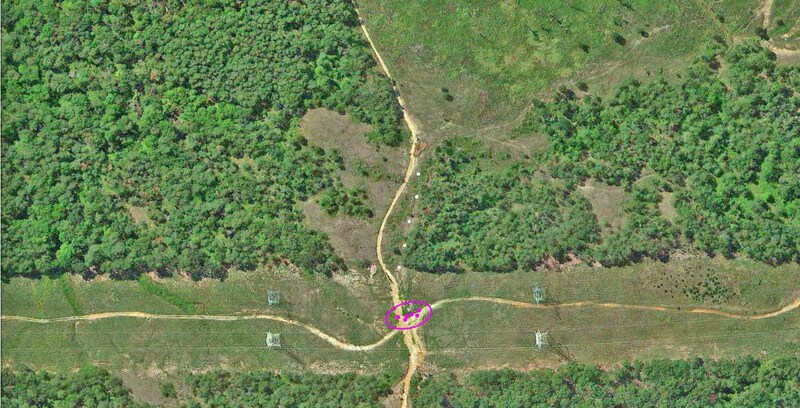 The “Woods Road” appears to have been rerouted since 1960 (white dots). If I weren’t so far away, it would be fun to retake this photo. It appears from Google Earth images that the road to the west of the power line was rerouted before 1993, and it is likely that most of the Virginia pine trees in the 1960 photo have been removed. There are probably some other changes that could be discerned from a photo repeat. Does the Woods Road follow a different route (dashed line)?. I guess those Virginia pines behind us are gone now, victims of the management plan to save the grassland. Detail of Bodine photo showing me with a recognizable T-shirt. Jean Worthley is carrying Kim. I’m not sure why my mother wrapped up that white T-shirt and put it in a closet soon after I grew out of it. I’m not sure why I put it in a box and moved it to Vermont when Dad’s house was sold in the 1990s. I’m not sure why I found the shirt last week when I also found the magazine photos of me wearing it. But all those unexplained events provided an excuse to post the following photo of the shirt exactly 53 years after the Bodine photo of it was published. Passing things on to the next generation is a distinguishing trait of humans. 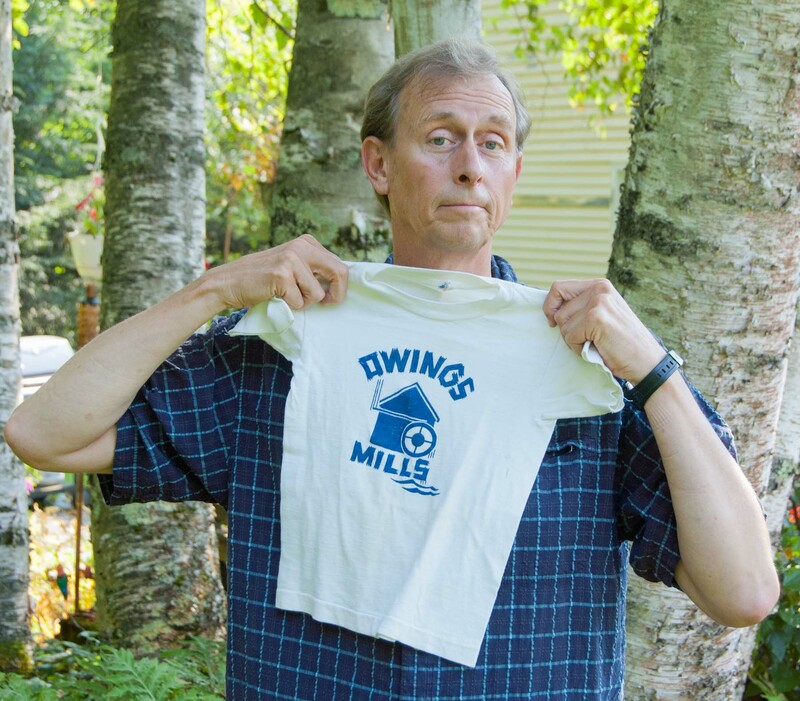 Somehow I always hoped I would get more than an old shirt. An Owings Mills T-shirt from the 1950s. Has this design ever been revived? From a negative made in ca. 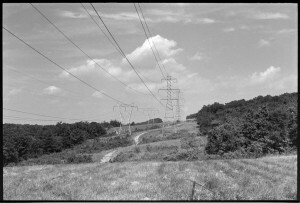 1974 of the power line swath in Soldiers Delight. The Bodine photo was made at the top of the hill in the distance. No clouds have been added to this or any other photo in this post. Looking at the photo of you and the Worthleys, it looks like you between the Moms and Francie with her head down, but where’s Will? Okay, names appear now in mouseover and shadowbox view. hard to believe that’s Will in the center and not you, but you were there and I wasn’t (until much later).